Diesel's original engine injected fuel with the assistance of compressed air, which atomized the fuel and forced it into the engine through a nozzle (a similar principle to an aerosol spray). The nozzle opening was closed by a pin valve lifted by the camshaft to initiate the fuel injection before top dead centre (TDC). This is called an air-blast injection. Driving the three stage compressor used some power but the efficiency and net power output was more than any other combustion engine at that time. 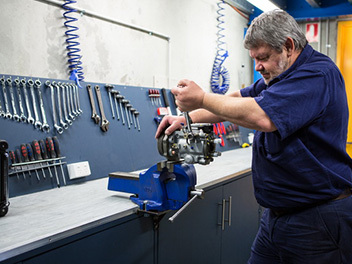 Diesel engines in service today raise the fuel to extreme pressures by mechanical pumps and deliver it to the combustion chamber by pressure-activated injectors without compressed air. With direct injected diesels, injectors spray fuel through 4 to 12 small orifices in its nozzle. The early air injection diesels always had a superior combustion without the sharp increase in pressure during combustion. Research is now being performed and patents are being taken out to again use some form of air injection to reduce the nitrogen oxides and pollution, reverting to Diesel's original implementation with its superior combustion and possibly quieter operation. In all major aspects, the modern diesel engine holds true to Rudolf Diesel's original design, that of igniting fuel by compression at an extremely high pressure within the cylinder. With much higher pressures and high technology injectors, present-day diesel engines use the so-called solid injection system applied by Herbert Akroyd Stuart for his hot bulb engine. The indirect injection engine could be considered the latest development of these low speed hot bulbignition engines. Diesel engines are also produced with two significantly different injection locations. "Direct" and "Indirect". Indirect injected engines place the injector in a pre-combustion chamber in the head which due to thermal losses generally require a "glow plug" to start and very high compression ratio. Usually in the range of 21:1 to 23:1 ratio. 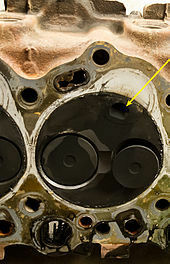 Direct injected engines use a generally donut shaped combustion chamber void on the top of the piston. Thermal efficiency losses are significantly lower in DI engines which facilitates a much lower compression ratio generally between 14:1 and 20:1 but most DI engines are closer to 17:1. The direct injected process is significantly more internally violent and thus requires careful design, and more robust construction. The lower compression ratio also creates challenges for emissions due to partial burn. Turbocharging is particularly suited to DI engines since the low compression ratio facilitates meaningful forced induction, and the increase in airflow allows capturing additional fuel efficiency not only from more complete combustion, but also from lowering parasitic efficiency losses when properly operated, by widening both power and efficiency curves. The violent combustion process of direct injection also creates more noise, but modern designs using "split shot" injectors or similar multi shot processes have dramatically amended this issue by firing a small charge of fuel before the main delivery which pre-charges the combustion chamber for a less abrupt and in most cases slightly cleaner burn. A vital component of all diesel engines is a mechanical or electronic governor which regulates the idling speed and maximum speed of the engine by controlling the rate of fuel delivery. Unlike Otto-cycle engines, incoming air is not throttled and a diesel engine without a governor cannot have a stable idling speed and can easily over speed, resulting in its destruction. Mechanically governed fuel injection systems are driven by the engine's gear train. These systems use a combination of springs and weights to control fuel delivery relative to both load and speed. Modern electronically controlled diesel engines control fuel delivery by use of an electronic control module (ECM) or electronic control unit (ECU). The ECM/ECU receives an engine speed signal, as well as other operating parameters such as intake manifold pressure and fuel temperature, from a sensor and controls the amount of fuel and start of injection timing through actuators to maximise power and efficiency and minimise emissions. Controlling the timing of the start of injection of fuel into the cylinder is a key to minimizing emissions, and maximizing fuel economy (efficiency), of the engine. The timing is measured in degrees of crank angle of the piston before top dead centre. For example, if the ECM/ECU initiates fuel injection when the piston is 10° before TDC, the start of injection, or timing, is said to be 10° BTDC. Optimal timing will depend on the engine design as well as its speed and load, and is usually 4° BTDC in 1,350–6,000 HP, net, "medium speed" locomotive, marine and stationary diesel engines. Advancing the start of injection (injecting before the piston reaches to its SOI-TDC) results in higher in-cylinder pressure and temperature, and higher efficiency, but also results in increased engine noise due to faster cylinder pressure rise and increased oxides of nitrogen (NOx) formation due to higher combustion temperatures. Delaying start of injection causes incomplete combustion, reduced fuel efficiency and an increase in exhaust smoke, containing a considerable amount of particulate matter and unburned hydrocarbons. They burn less fuel than a petrol engine performing the same work, due to the engine's higher temperature of combustion and greater expansion ratio. Gasoline engines are typically 30% efficient while diesel engines can convert over 45% of the fuel energy into mechanical energy. They have no high voltage electrical ignition system, resulting in high reliability and easy adaptation to damp environments. The absence of coils, spark plug wires, etc., also eliminates a source of radio frequency emissionswhich can interfere with navigation and communication equipment, which is especially important in marine and aircraft applications, and for preventing interference with radio telescopes. The longevity of a diesel engine is generally about twice that of a petrol engine]due to the increased strength of parts used. Diesel fuel has better lubrication properties than petrol as well. Indeed, in unit injectors, the fuel is employed for three distinct purposes: injector lubrication, injector cooling and injection for combustion. Diesel fuelis distilled directly from petroleum. Distillation yields some gasoline, but the yield would be inadequate without catalytic reforming, which is a more costly process. Diesel fuel is considered safer than petrol in many applications. Although diesel fuel will burn in open air using a wick, it will not explode and does not release a large amount of flammable vapour. The low vapour pressure of diesel is especially advantageous in marine applications, where the accumulation of explosive fuel-air mixtures is a particular hazard. For the same reason, diesel engines are immune to vapour lock. For any given partial load the fuel efficiency(mass burned per energy produced) of a diesel engine remains nearly constant, as opposed to petrol and turbine engines which use proportionally more fuel with partial power outputs. Diesel engines can accept super- or turbo-charging pressure without any natural limit, constrained only by the strength of engine components. This is unlike petrol engines, which inevitably suffer detonation at higher pressure. Biodieselis an easily synthesized, non-petroleum-based fuel (through transesterification) which can run directly in many diesel engines, while gasoline engines either need adaptation to run synthetic fuels or else use them as an additive to gasoline (e.g., ethanoladded to gasohol). An indirect injection diesel engine delivers fuel into a chamber off the combustion chamber, called a pre combustion chamber or ante-chamber, where combustion begins and then spreads into the main combustion chamber, assisted by turbulence created in the chamber. This system allows for a smoother, quieter running engine, and because combustion is assisted by turbulence, injector pressures can be lower, about 100 bar (10 MPa; 1,500 psi), using a single orifice tapered jet injector. Mechanical injection systems allowed high-speed running suitable for road vehicles (typically up to speeds of around 4,000 rpm). The pre-chamber had the disadvantage of increasing heat loss to the engine's cooling system, and restricting the combustion burn, which reduced the efficiency by 5–10%. Indirect injection engines are cheaper to build and it is easier to produce smooth, quiet-running vehicles with a simple mechanical system. In road-going vehicles most prefer the greater efficiency and better controlled emission levels of direct injection. Indirect injection diesels can still be found in the many ATV diesel applications. Direct injection diesel engines have injectors mounted at the top of the combustion chamber. The injectors are activated using one of two methods - hydraulic pressure from the fuel pump, or an electronic signal from an engine controller. 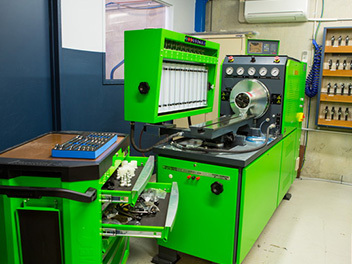 Hydraulic pressure activated injectors can produce harsh engine noise. Fuel consumption is about 15–20% lower than indirect injection diesels. The extra noise is generally not a problem for industrial uses of the engine, but for automotive usage, buyers have to decide whether or not the increased fuel efficiency would compensate for the extra noise. 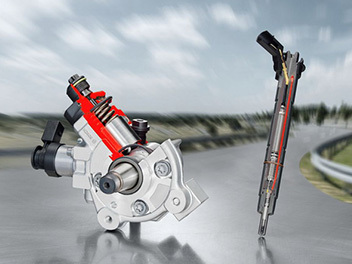 Unit direct injection also injects fuel directly into the cylinder of the engine. In this system the injector and the pump are combined into one unit positioned over each cylinder controlled by the camshaft. Each cylinder has its own unit eliminating the high-pressure fuel lines, achieving a more consistent injection. This type of injection system, also developed by Bosch, is used by Volkswagen AG in cars (where it is called a Pumpe-Düse-System—literally pump-nozzle system) and by Mercedes-Benz ("PLD") and most major diesel engine manufacturers in large commercial engines (MAN SE, CAT, Cummins, Detroit Diesel, Electro-Motive Diesel, Volvo). With recent advancements, the pump pressure has been raised to 2,400 bars (240 MPa; 35,000 psi), allowing injection parameters similar to common rail systems. In common rail systems, the separate pulsing high-pressure fuel line to each cylinder's injector is also eliminated. Instead, a high-pressure pump pressurizes fuel at up to 2,500 bar (250 MPa; 36,000 psi), in a "common rail". The common rail is a tube that supplies each computer-controlled injector containing a precision-machined nozzle and a plunger driven by a solenoid or piezoelectric actuator.